Is it possible to stop Congo’s massive commercial hunting before the forests are empty of animals? Maybe, and maybe it is easier than we thought. 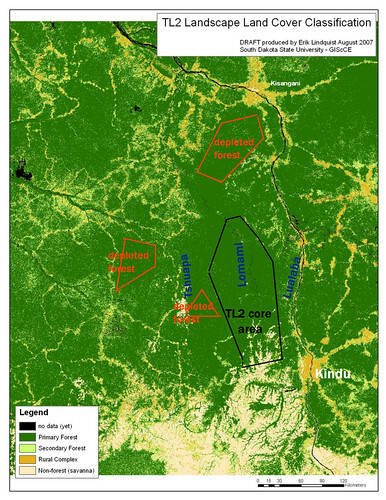 During 2007 and 2008, the TL2 project inventoried intact forest — with low, or no human population — between the Tshuapa and the Lualaba Rivers. This was mainly the Lomami River basin. We were looking for bonobo, the great ape that is only in the Congo basin. What we found was “empty” forest in areas where bonobo had previously been reported. Dense bonobo populations remained only in the south, including areas where they had not been reported earlier. There is still a lot of forest in central Congo but much has been riddled by small settlements (yellow)or depleted of game by commercial hunting (impossible to detect on a map). Hunting had emptied the forests to the north and west. Even further south we found that commercial hunting had moved into the last bonobo forests. We saw evidence of it everywhere. Hunting snares on the forest floor, meat drying on racks in hunting camps, bicycles loaded with meat headed towards Kindu. We even saw bonbo killed and sold as bushmeat. The southern part of our area was the most intensively hunted. It fed the busmeat markets of Kindu. Of 31 hunters “interviewed” along forest paths, more than half of them (16) were foreigners (= not the local ethnic group that “owns” the forest). Most were coming from the Province of Kasai Oriental where forests are hunted-out. Not one of the 31 was hunting for his family; they were all commercial hunters. About ¼ were using shot guns and the others were using metal and nylon snares. Monitoring bushmeat transported from the TL2 forest towards Kindu is relatively easy because all transporters have to cross the Kasuku River by dugout , and there are only three places where that is possible. As all bushmeat is carried in backpacks or bicycle-packs, transporters are easy to approach as they wait for the dugout. Who are these transporters? Rarely the hunters themselves, much more frequently these are people who buy their loads from one or several hunters in villages around the forest; these transporters are middlemen who usually sell again to the vendors in Kindu’s various markets. Nearly 400 bushmeat transporters were contacted; 85% of the transport was by bicycle and the average load weighed 54 kilograms (119 lbs). We estimate over 30 metric tons a month of bushmeat entered Kindu from the TL2 landscape. It is likely that this makes up at least 75% of the bushmeat currently sold in Kindu (population of 135,500). In terms of animals killed: 6,300 animals a month were brought into Kindu from the TL2 forests. Of these, approximately 3,350 monkeys, 2,250 antelope and 19 (!) bonobos. If maintained, this rate would decimate the TL2 bonobos. Extrapolating to annual TL2 bushmeat on the Kindu market: 76,000 animals of which 227 are bonobos. Whereas 91 percent of bushmeat transporting is done by men, the market vendors of bushmeat are almost all women. Of 31 market women interviewed, 11 had sold bonobo bushmeat in the last six months. These vendors are a snapshot of “making it” as a woman in DRCongo. All the vendors had children; twenty (65%) were female heads of households being widowed, unmarried or living without spouse. None of the vendors had finished high school and eight of 31 were totally unschooled. 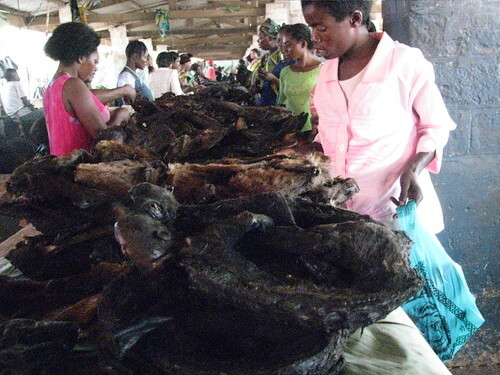 The bushmeat market vendors and final buyers. A full bushmeat bicycle load entering Kindu is worth about 147 US dollars on retail market. Most bicycle transporters who buy from the hunter and resell in Kindu can expect to make a clear profit of over 50 dollars from a full load of meat. They may have spent as little as two weeks getting it, including bicycling to point of purchase, waiting for a full meat load, and bicycling back. The mark-up from hunter to final retail sale is on the order of 300 to 330 percent. An overall estimate gives an annual retail market value of over 980,000 US dollars for bushmeat from TL2 in Kindu. Given this profit how can the bushmeat chain be dismantled? What controls could we lobby for as a small foreign-funded project? Scouring a collection of Congolese environmental law, one decree seemed obvious: the one concerning protected species. Nationally it was against the law to kill bonobo. In Maniema no one seemed to know about it (even the governor later told us he ate bonobo). We started our campaign with meetings, brochures and radio. Through a combination of good luck and good people we were able to push a lot farther than we had thought possible. Provincial and traditional authorities participated. There was excellent collaboration from the governor to village leaders. The mayor of Kindu campaigned, the provincial minister of the environment campaigned, the chefitaine of the Bangengele campaigned and so did the deputies of Kailo and many more. The governor declared a three month no-hunting season from July through September 2009 — there was at least 90% compliance. The bushmeat market in Kindu closed down and bicycles started transporting goats and chickens rather than bushmeat. 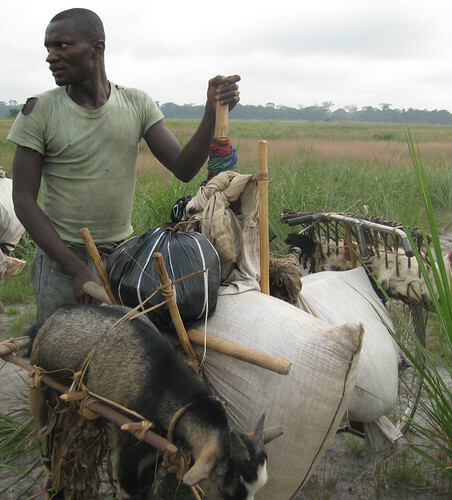 In August 2009, this bicycle transporter headed for Kindu has a goat, chickens and rice, all on two wheels. Once the hunting season came to an end, the authorities began to campaign for a protected area in the most sensitive bonobo forest. And so far they have truly done so with enthusiasm. In villages – villagers knew that their animal populations were decreasing as they had to walk farther and farther to reach good hunting ground. In villages – villagers also realized other people were reaping benefits from hunting “their” animals, but their own problems (no schools, no health care) were not improving. In Kindu, – the politicians decided a national park might bring outside money to what was otherwise an extremely impoverished region. This is a short, hopeful chronology, but the antecedents aren’t promising. The bonobo forest was emptied to the north; the bonobo forest was emptied to the west. Maybe this chronology can be hopeful only because it covers so short a time period. What about a year from now–? –or two years? There was one critical element missing during the closed hunting season – that was enforcement. People stopped transporting bushmeat because of the publicity and monitoring, but a few hunters –mostly foreign –continued, and stocked their meat. They weren’t punished. In fact, there is no real enforcement capacity. That does not bode well for the next no-hunting season. The strong collaboration that pushed the no-hunting season, publicized protected species, and cleared the forests – at least briefly – of snares and cartridges must persist. With that support, bonobos, too, can persist. We must maintain and strengthen this alliance of authorities, villagers and our TL2 project in order to assure creation of a protected area in the bonobo forest where bonobos can continue to live in all the raucous din of a forest alive with animals. This is how the bushmeat chain looks through photos. BUSHMEAT 11: Bonobo for dinner? Bushmeat 10: Did the Bridge Collapse Create a Bushmeat Boom for Mbuti Pygmies? Congo Tourism 4 : Dugout, Moto-bike, and Hiking-boot to Camp Bonobo. This entry was written by Terese Hart, posted on 2009-11-15 at 1:54 pm, filed under About the project, Bonobo, Bushmeat, Kindu. Bookmark the permalink. Follow any comments here with the RSS feed for this post. Post a comment or leave a trackback: Trackback URL. In your opinion, to end the killing of bonobo and other endangered animals, is education and propaganda more effective, or just enforcement of existing laws? Pamphlets or guards? Or can the two just work from different ends, one on the consumer side, and the other on the supplier side? What do you think has a greater success rate? Thanks for all your data and time. Wonderful to hear from you. Did you see your shirts in the photos at the end? I believe they are in two photos…always a “big item”. Both enforcement and education have to work together. Part of the reason we are pushing for a national park is that it is “easier” to have enforcement working through the parks department and with defined borders. We will hire new park guards and train them from the start. Whereas the environment ministry in Maniema (and everywhere), in charge of enforcement outside of parks, is full of too many, too under-paid employees. And the area to survey, where enforcement is needed is too huge. We are hopeful. For the park, we are hopeful. As to the second floor. When it is done it will probably go for 500 USD a month. Hey, it would be great to have a place for volunteers and visitors. Why don’t you set up a studio??!! endangered endemic species of red colobus (piliocolobus parmentiorum) does not exist inside the proposed park borders, but partly inside the area of high elephant density. My question:Are there SOS strategies for this very endangered species? How big to make a protected area is always a difficult question. To have a national park respected as a national park, it is important NOT to have very much micro-zoning inside of it — so no people. Reserves are more able to have people and can have variable restrictions. But for a Reserve to effectively protect biodiversity for the long-term there must be few people and it must STAY few people. So, advantages must be brought to the OUTSIDE of the Reserve (schools, medical) and not in it. We very much want to assure that P. parmentiorum is protected. It has complete protection by the law — all red colobus do — but they are among the most hunted monkeys. You are doing a great job keep it up. As director of the TL2 Project I represent an outstanding team of Congolese field biologists. My husband and I set out in 2007 to explore an unknown forest. We found bonobos, a new species of monkey, forest elephant, okapi, Congo peacock... With our staff and local leaders we sought a means to protect this wilderness forever. In July 2016 the Lomami National Park was declared: 8,874 sq km. Our mission, with our TL2 staff, is now to build effective conservation from village-base to national administration for the park and buffer zone. Read more. Thank you from TL2! You contributed $1,942,000 in 2018 and we turned it into action on the ground. We used these funds to increase our monitoring and patrol coverage in the park (in 2018, patrols covered a total of 13,424 km mainly off-trail through forest); We maintained a permanent outreach presence in the buffer zone helping local populations with community projects (a school, a bridge, path shelters-we added two). We expanded our fishpond project to villages farther north to provide hunters an alternative livelihood. Your support and interest are the greatest motivation possible. Our responsibility is to keep you informed through this blog-site and through our reports and photos. Don’t hesitate to ask us specific questions. Our direct thanks go to (in the order that funding was received in 2018) Wildcat Foundation, Rainforest Trust, Woodtiger Fund, Arcus Foundation, USFish and Wildlife Service, FCF (anonymous), contributors to the Balanga West school fund and all the contributors through Paypal at this blogsite. Many thanks from all of us in TL2. The three river basins of the Tshuapa, Lomami and Lualaba Rivers (TL2), Congo’s forest enigma, ascend through its geographic heart. We have answered our first question "Is Congo's own great ape, the bonobo, found in TL2?" Yes it is? And so is Congo's endemic rainforest giraffe, the okapi and the rare Congo peacock. But, now the challenge is to bring real protection to the forests before the bonobo and all other large animals are hunted out. We’ve been in the field – Congo’s TL2 – since May 2007. More on the project. More about us. Thank you. Check your inbox or spam folder to confirm your subscription! WordPress | Sandbox | Blog and project since May 2007.